Explore the 'dark side' of New Orleans with a drinking tour that is full of history, ghost, voodoo and vampire stories. Hear about some of the city's mysteries, including unsolved murders and paranormal activity. Along the tour route guests will be allowed to stop in and grab drinks to go at bars! Open your mind to the possibility of experiencing paranormal activity during the tour, including cold spots, seeing apparitions, and catching orbs and apparitions in pictures. A real EMF Meter - Ghost/Paranormal Detector will be used during this tour. We are the home of the Drunken Tour.... Where learning is intoxicating. Meet your guide in the French Quarter to begin your tour of haunted New Orleans. Choose an afternoon or an evening tour. Admire the gorgeous architecture of the French Quarter while hearing stories of New Orleans history, including hauntings, Voodoo, vampires, and ghosts. Learn about the city's traditional burial practices. Hear beautiful love stories that end in tragedy. 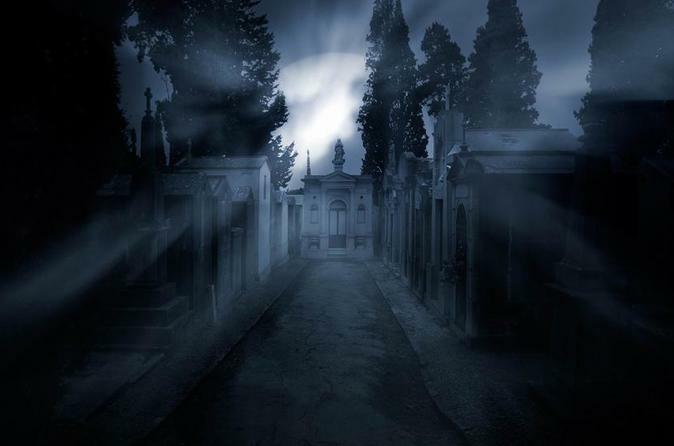 Visit locations where vampires held their victims captive. Learn the difference between vampires of legend and vampires of history. Together this tour group will explore and investigate paranormal activity using a real paranormal / ghost detector. (A real EMF Meter - Ghost/Paranormal Detector will be used during this tour.) Guests will be allowed to stop in the local bars and grab to go drinks along the tour route. Visit the home of the most predictable ghost, Julie. This story is one of the most tragic love stories in New Orleans. Hear the story of the Carter Brothers, who were tried, convicted, and put to death - however they are still seen by some today. Visit the location of the largest mass murder in New Orleans history. To this day the crime is unsolved, though the ghosts remain.